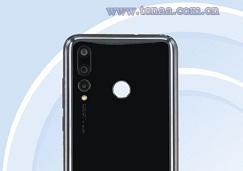 Gizchina claims to have unearthed a slide showing details on the specs of the upcoming Huawei 'punch-hole' camera pioneer device, the Nova 4. This slide appears to clearly indicate that this phone will have two separate variants, one of which will have a novel 48MP sensor in its triple-rear-camera setup and one that will not. This slide also suggests that the Nova 4 will ship with the Kirin 970, not the 980. The Nova 4 is widely tipped as Huawei's first device to use a punch-hole-style front-facing camera. This technology mimics Samsung's Infinity-O display technology considerably. Considering the Nova line's typical price-point, its latest generation is likely to compete directly with the Samsung Galaxy A8s, another phone with this next-gen form of screen that has just been released in China. 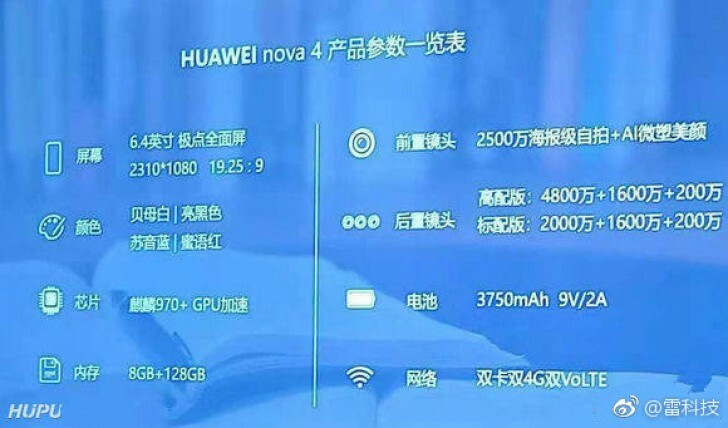 The Huawei Nova 4 may have two SKUs that differ only in the nature of their rear-facing cameras. This possibility has been raised by a slide leaked by the media outlet GizChina. It appears to show that the Nova 4 will have these possible variants: one with a triple camera that incorporates a 48MP sensor. This new CMOS is also reportedly destined for the upcoming Honor V20, although it may be a single module in the case of this device. In the Nova 4, however, it will be accompanied by a 20+16MP dual-camera module. The other version of the Nova 4 will also have a triple camera, but will substitute the ultra-high-res component for a more conventional 20MP shooter. The rest of the Nova 4's specs will apparently stay constant across the two variants. They include a 6.4-inch full-HD screen with a 19.25:9 display, 8GB of RAM and 128GB of internal storage and a 3750mAh battery. Interestingly, next to a chip-like graphic, the English-language characters '970+' are found. This suggests that the Nova 4 will not get the Kirin 980 processor as previously thought, and may have to do with a Kirin 970 that may or may not be optimized in some way instead. Then again, with a reported release date of December 17, it will not be so long now until these rumors can be verified.